We think that it is a good all-in-one office device for people on a budget. P addresses their new generation printers to a relatively wide segment at the office supplies market. Let me explain what I mean – it doesn’t matter if you need a printer to use at home or for your business needs, the multifunctional printer we tested for you may be just the right choice. Ladies and gentlemen, viewers of digitalmag.net, today we are going to tell you in details how HP DeskJet Ink Advantage 4625 performed during our tests. Taking a first glance at the printer, we must mention its bulky dimensions 448x352x207mm and also its weight of 6.27kg. The bulkiness of this device is entirely compensated by the wide range of functions it offers. But don’t worry, all this comes at an affordable price. This machine belongs to HP – one of the brands with traditions in this market filed so let me tell you something – we are sure it will soon become your irreplaceable office friend thanks to its multifunctionality. The basic purpose of the brand with this new generation office devices was the optimization of the time and money you spend on printing. The resolution when printing from a computer is up to 4800×1200 dpi. 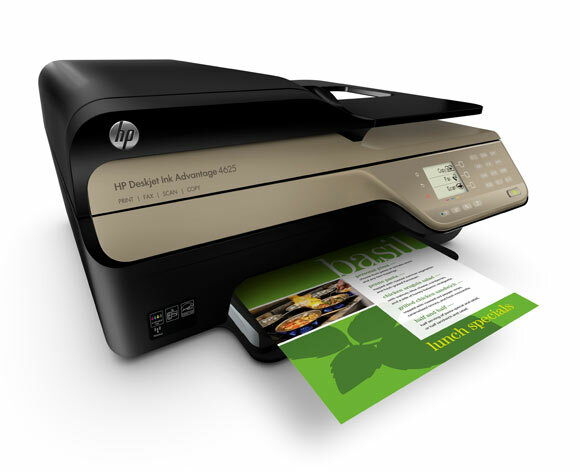 HP DeskJet Ink Advantage 4625 will also impress you with a variety of other functions. Among them are copying, scanning and faxing documents. The resolution when printing from a computer is up to 4800×1200 dpi. The printing formats available on this device are A4, A5, B2 as well as envelope formats. Unfortunately poster formats are unsupported. The ink cartridges are four and are easily replaced separately. Available for the users of this machine is the new CIS – Contact Image Sensor scanning technology. The processor frequency for this model is 240MHz. The scanner is ADF of flatbed type. Available for the users of this machine is the new CIS – Contact Image Sensor scanning technology. It helps reduce the power consumption thanks to the photo-sensitive sensors located a few millimeters under the scanner glass surface. Its resolution is up to 1200×1200 dpi and the color depth on its part is 24bit. Now let’s talk about the printing speed: in black-and-white mode HP DeskJet Ink Advantage 4625 prints 8 pages per minute and 7 pages and a half when working with colors. Our tests concluded that one of the functions which will be extremely useful to you and will save you precious time is the wireless connection available. As a whole HP Deskjet Ink Advantage 4625 is a useful all-in-one office machine that comes at an affordable price.